On March 23rd, Mozilla launched its newest and most awesome browser: Firefox 4. Along with a plethora of features, including faster performance, better security and the whole nine yards, Firefox 4 included a cutting edge privacy feature called Do No Track (DNT). For the uninitiated, DNT simply tells sites “I don’t want to be tracked” via a HTTP header visible to all advertisers and publishers. Mozilla’s new Privacy Blog has several posts on the feature, including a new one today releasing a Do Not Track Field Guide for developers. 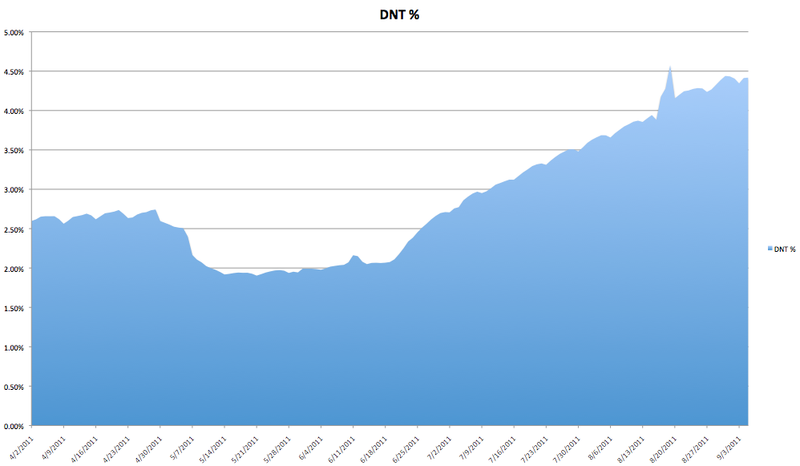 Based on our current numbers, we’ve been seeing for several weeks now just under 5% of our users with DNT turned on within Firefox. Grab logs from multiple data-centers. “DNT:1” User HAS set DNT and does *not* wish to be tracked. The above script is run on a nightly basis and the result is then plotted over a time graph, as included with this post. While it is possible to uniquely identify each instance of browser, doing so will require that we start tracking users, thereby defeating the exact purpose for why DNT was created in the first place. Feel free to leave us a comment or email: (aphadke at_the_rate mozilla dot com – Anurag Phadke) for more information. What’s the point of using hashed IPs to track users? It adds nothing to privacy; with only 2^32 possible inputs, it would be trivial to figure out which IP corresponds to a given hash. Might as well just use IP addresses directly. The original idea was to hash all the IPs seen on a given day with a strong randomly generated salt and then discard that salt at the end of the day. That way, for any given day we’d be able to look at logs from multiple log sources and say whether we saw records that came from the same IP address multiple times, but we would not be able to go back and retrieve specific records for a given IP address we were interested in. While I still think there is some merit to that idea, it turns out that the complexity of making sure that we managed the salts properly and the risk of someone finding a creative way to crack it made us decide it would be easier to skip that approach for now. What we do instead is keep the IP address for the log records in a separate file which we can join based on the file name and row number. Then, we simply delete the non-anonymized data from our warehouse according to our data retention policy. @Jim maybe you should read up on how hashes work. [kjfihsfihsfiuhsf&&%&^%SDFSDFI*8] Now which IP is that? I find it ironic that you’re tracking users with DNT set 😉 With that flag set, I would expect compliance to mean you do not track _anything_ about me – not even the fact that I made an update ping. Not hashed IP addresses, not non-identifying information, _nothing_. I would be fine with “somebody made an update ping”, of course; however, I am against anything that can distinguish between me making a second request and somebody at the other end of the Earth making an independent request. Sad; I had thought Mozilla would be better than this. If even Mozilla is tracking despite the flag, I have no trust in anybody else actually obeying the flag either. Yes, actually obeying the spirit of the flag would cripple metrics a lot. I had thought user privacy was one of the core values of Mozilla; I guess not, or at least we have vastly different definitions. @Ferdinand: Maybe you should better read what Jim said because he is right. Creating a rainbow table for all possible IP addresses to revert the hashing isn’t unthinkable. Also, if somebody wants to check the activity of a particular IP address then hashing won’t help: hash the IP address, then look up all the log entries for this hash. So while hashing definitely helps it isn’t the ideal solution. Indeed… if the IP were salted with some secret data that would be more helpful, since you would need to know the salt first. Still, ‘security by obscurity’ and all that. Is ‘anonymised’ data also deleted after 6 months? Anyway it’s interesting to see the ~linear increase in adoption after the pref was exposed in the menus. I feel like we should do that more often. There’s so many handy features of Fx that are relegated to the ‘about:config’ tab which I’m sure people would use if they knew the features existed. The rainbow table is a valid concern in this day of clusters large enough to theoretically pull it off. That said, if the salt is large and randomly generated every day, it would not be a very feasible thing to do. 1. Data theft — If someone managed a break in and they could download the TBs of data, we want to make it as difficult as is reasonably possible to prevent them from seeing IPs. 2. Data acquisition — If Mozilla were subpoenaed or otherwise required to hand over any available data about a particular IP address, we would like to have as little capability and liability to do that as is reasonable. x. Data misuse — Any reasonably implemented strategy should prevent misuse by Mozilla itself, including the potential for a change of policy that would open up old data to be used in ways that were not originally planned. The hashing strategy is likely to have handled all three of these concerns, but as I mentioned above, it turned out to be safer and simpler to avoid using hashing at all. @Wladimir — Setting aside rainbow tables, the hashing strategy that was originally described was specifically designed to prevent the ability to look up a particular IP address. If you salt the hash with a good random salt that is generated every day and is *not* kept around after that day is passed, then you would not be able to do a lookup the way you describe. We are *not* tracking anything about the users themselves. We are only monitoring how many requests are coming in to our site with the DNT feature enabled. DNT is a complex thing to define, and it is still a source of considerable discussion. I’d suggest downloading the DNT field guide and reading through it. The background and definitions are very useful. As far as the data in the logs that were used to generate this analysis, it is important to consider that, other than the IP address, there is no potentially identifying information (PII), and we are not building a user profile or compiling usage on a user basis to track the activity or choices of a user over time. I believe that, since we are doing none of those user tracking things, the analysis that we are doing with this data falls well outside what most people expect to be protected from when they turn DNT on. I’m sorry, I didn’t realize the header was missing half of the phrase “do not track me in a personally identifiable way”, instead of what it says on the tin, “do not track”. I don’t care if that information is not potentially identifying information; all I care about is if I’m being tracked in any way. Again, my feelings on this is particular to Mozilla – with Google or Omniture, I can expect to be tracked and respond accordingly (by blocking access or other local means). My problem was merely that Mozilla is doing things that are against its expressed value system.